* suggestions for further reading. Challenging not just what we think but how we think, Foucault's work remains the subject of heated debate. 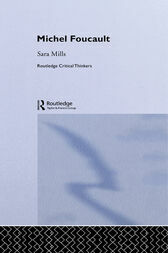 Sara Mills' Michel Foucault offers an introduction to both the ideas and the debate, fully equipping student readers for an encounter with this most influential of thinkers.